COLOR(S):Black, dark reddish brown, or roan, with or without tan points. The Field Spaniel is a combination of beauty and utility. They are a well-balanced, substantial medium sized hunter/companion. They are built for activity and endurance in heavy cover and water. Field Spaniels have are of noble carriage, have a proud yet docile attitude, and are sound and free-moving. They are slightly longer than they are tall, with evenly-distributed weight. Field Spaniels have a liver, black, or roan color with or without tan markings. They have feathering in their coat on the chest, belly and back of the legs. They can have either a docked tail or natural undocked tail. They are sturdy and much improved since the 1960s. They are an affectionate, intelligent breed who are eager to please. Suited for family life, they are also willing to work and for hunting in open terrain. Field Spaniels are happy, level-headed and of good sound temperament. They are excellent in perseverance and endurance in field trials. A lively, fun-loving and vocal breed, the Field Spaniel makes an excellent pet for those seeking a pleasurable personality. Field Spaniels are responsive, friendly and lively. They are enthusiastic about their owners and eager to please. Field Spaniels are good at endurance and perseverance field trials, and get along with everyone. They are fun-loving, vocal, and love to play in the water. They have an even-temper, and have much the same personality as the Cocker Spaniel. Moderate care of the Field Spaniel\'s silky coat is required. Recommended brushing for 5 minutes twice a week. Care must be taken so that the coat does not mat. Professional trimming should also been done a few times a year. Regular ear cleaning, as their ears may be prone to infection. Hip dysplasia, eye problems such as ectropion, entropion, and PRA (Progressive Retinal Atrophy) and thyroid disease. Other health concerns include subaortic stenosis. 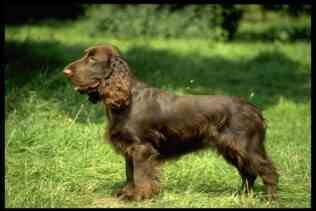 Exercise is essential for the Field Spaniel as they are a very active breed. Frequent runs on a leash and a fenced in back yard are suggested. Quick to learn, they respond to the sound of your voice. Kind and consistent training is recommended.